Your vehicle is equipped with driver's and front passenger's pre-tensioner seat belts. The purpose of the pre-tensioner is to make sure that the seat belts fit tightly against the occupant's body in certain frontal collisions (or side collisions). The pre-tensioner seat belts may be activated in crashes where the frontal collision (or side collisions) is severe enough. When the vehicle stops suddenly, or if the occupant tries to lean forward too quickly, the seat belt retractor will lock into position. 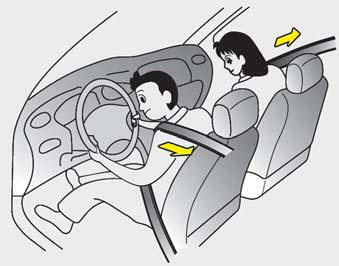 In certain frontal collisions (or side collisions), the pre-tensioner will activate and pull the seat belt into tighter contact against the occupant's body. If the system senses excessive tension on the driver or passenger's seat belt when the pre-tensioner activates, the load limiter inside the pre-tensioner will release some of the pressure on the affected seat belt. 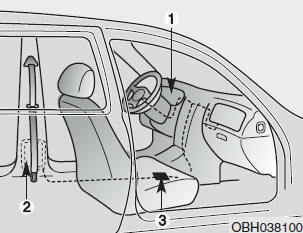 The pre-tensioner will activate not only in a frontal collision but also in a side collision, if the vehicle is equipped with a side or curtain air bag. Do not put anything near the buckle. Placing objects near the buckle can adversely affect the buckle pretensioner and may increase the risk of personal injury in the event of a collision. WARNING Do not put anything near the buckle. Placing objects near the buckle can adversely affect the buckle pretensioner and may increase the risk of personal injury in the event of a collision. • Both the driver's and front passenger's pre-tensioner seat belts may be activated in certain frontal collisions (or side collisions). The pre-tensioners will not be activated if the seat belts are not being worn at the time of the collision. • When the pre-tensioner seat belts are activated, a loud noise may be heard and fine dust, which may appear to be smoke, may be visible in the passenger compartment. These are normal operating conditions and are not hazardous. • Although it is harmless, the fine dust may cause skin irritation and should not be breathed for prolonged periods. Wash all exposed skin areas thoroughly after an accident in which the pre-tensioner seat belts were activated. for approximately 6 seconds after the ignition switch has been turned to the ON position, and then it should turn off. If the pre-tensioner seat belt is not working properly, this warning light will illuminate even if there is no malfunction of the SRS air bag. If the SRS air bag warning light does not illuminate when the ignition switch is turned ON, or if it remains illuminated after illuminating for approximately 6 seconds, or if it illuminates while the vehicle is being driven, have an authorized HYUNDAI dealer inspect the pretensioner seat belt and SRS air bag system as soon as possible. • Pre-tensioners are designed to operate only one time. After activation, pre-tensioner seat belts must be replaced. All seat belts, of any type, should always be replaced after they have been worn during a collision. • The pre-tensioner seat belt assembly mechanisms become hot during activation. Do not touch the pre-tensioner seat belt assemblies for several minutes after they have been activated. • Do not attempt to inspect or replace the pre-tensioner seat belts yourself. This must be done by an authorized HYUNDAI dealer. • Do not strike the pre-tensioner seat belt assemblies. • Improper handling of the pre-tensioner seat belt assemblies, and failure to heed the warnings not to strike, modify, inspect, replace, service or repair the pre-tensioner seat belt assemblies may lead to improper operation or inadvertent activation and serious injury. • Always wear the seat belts when driving or riding in a motor vehicle. • If the vehicle or pre-tensioner seat belt must be discarded, contact an authorized HYUNDAI dealer.